We celebrated the approaching end of tomato season 2012 Wednesday evening with a plate of fresh-picked tomatoes and basil from our garden plus a sweet yellow pepper and some good mozzarella and balsamic. Our tomato vines have pretty much died back—victims, it appears, of early blight, an endemic disease which despite its “early” name generally wrecks havoc with the plants late in the season as leaves die from ground up until there are nearly no leaves left to nourish the plants. Still, I picked about three-fourths of a colander of medium-sized red tomatoes—mostly Rodade, which I planted late, and Best Boy, which seemed to produce its best fruit when other varieties were shutting down production, plus some Amish Paste. Another looming factor, of course, is frost. Tomatoes—natives of South America—are extremely frost sensitive. So far this fall, we’ve escaped frost, with the temperature dipping into the high 30’s only once. The local forecast for tonight (Oct. 12), however, calls for 33°F, which could well mean frost-wilted tomato leaves tomorrow morning. That, of course, would be the end of Tomato Patch 2012. Though we’ve had our last large plate of tomatoes, we’ll have a few more tomatoes over the next week or so. 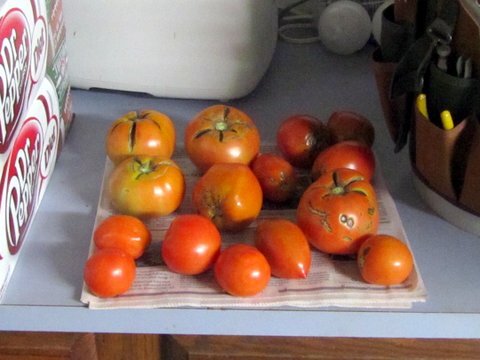 In anticipation of soon-coming frost, I’ve picked 15 tomatoes with some color and brought them into our garage, where they’ll ripen on a bed of newspaper. I’ll check them daily to make sure we promptly eat those that ripen and discard those that go bad. It’s sad to see Tomato Patch in nearly total decline. Gone are days when I picked multiple colanders of tomatoes, sometimes even a bucket or two. But the memories are vivid: The joy of starting tomato plants from seed in April and transplanting them into the garden in late May. The sense of contentment as I trained them and watched them flower and set fruit. The experience of biting into the first Sungold cherry tomato in early July and later slicing the first big-red Celebrity. The fragrance filling our house after I’ve cooked a batch a batch of tomato sauce destined for our plates and our freezer. The taste of that last large plate of sliced tomatoes, mozzarella, basil, and balsamic. Ah, Tomato Patch 2012, thank you! Grow it! Eat it! Treasure the memories! 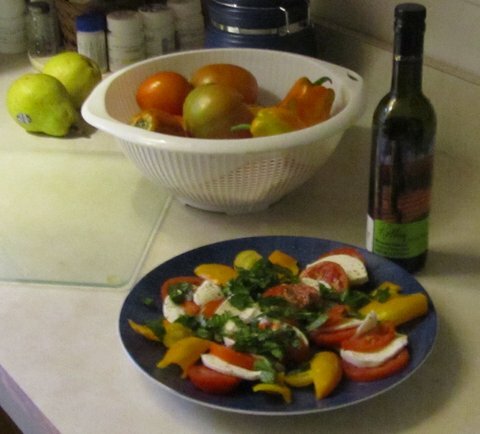 Looking at that plate of tomatoes, basil and balsamic vinegar make me long for next July.